Top-notch voice acting, I await you replacing everyone in all future game projects. Just needed a slight touch up since every line was delivered a couple of seconds after the text appears. Thanks so much! This was the first time I've ever done any voice acting in my games (or ever). For my next project I will definitely download some audio editing program, this time I didn't have time to cut the dead air at the start of every voice clip. Thanks so much! haha. I ran out of time at the end and decided to just not have text. I did some copy and pasting but must have forgot to delete that part. I'm going to check out your game immediately . 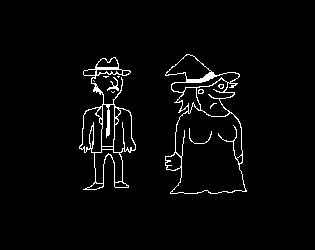 a game about scarcity called "scare city", where you play a noir detective-style matchmaker trying to find clues to make monsters fall in love. GENIUS.